The S&P 500 snapped an eight-session winning streak on Tuesday, but U.S. stocks still have strong momentum heading into the first-quarter earnings season. The index flirted with the 2,900 level this week, which is a price that we haven’t seen since last October. One big change since then is that average U.S. earnings showed 20%-plus year-over-year growth in the first three quarters of 2018 and now we’re staring at the first quarterly earnings decline in the S&P 500 in three years. The quarterly reports we’ll see over the next few weeks will go a long way to determining if the recent momentum can continue. In the meantime, Brexit is one potential headwind for global stocks that seems to be off the table for the time being. The EU suggested on Wednesday that U.K. legislators delay a decision on how and when to leave the economic group until Oct. 31. Elsewhere, trade talks between the U.S. and China continued to progress, but without a definitive resolution. On Friday, China reported that March exports increased 14%, doubling expectations. Back at home, bulls were encouraged by the weekly jobless claims report on Thursday. The print of 196,000 marked the lowest weekly reading since 1969. Earlier in the week, core prices for both consumers and producers showed slower growth in March than in February, which helps support the Fed’s recent pause in interest rate hikes. Next week will be relatively quiet on the economic front. As a reminder, U.S. markets will be closed on April 19, for the Good Friday holiday. Anadarko Petroleum (APC) was a bigger winner this week, after receiving a $33 billion takeover bid from Chevron (CVX). Investors will receive a mix of cash and stock valued at $65 a share, representing a 37% premium. On the other hand, Bed Bath and Beyond (BBBY) was a large earnings-related decliner, falling nearly 9% a day after disappointing investors with its results. 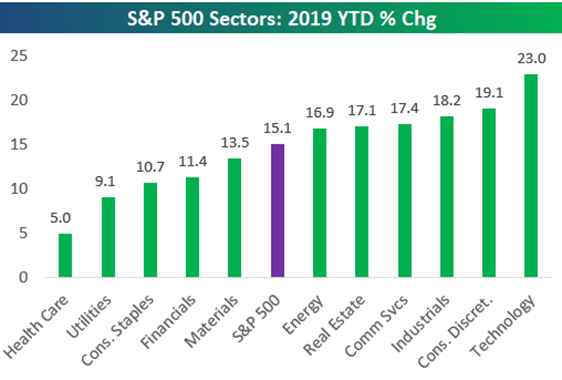 As the following chart shows, the S&P 500 has already gained 15% year-to-date… but facing the first quarterly earnings decline in three years, should you put new money to work in recent winners (Technology), or buy the laggards (Healthcare)? 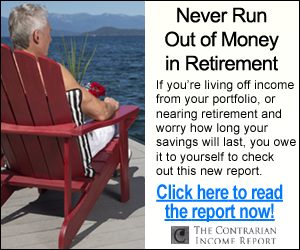 If you’re nearing retirement or already retired, all you really care about is generating consistent income and protecting your hard-earned nest egg– not whether a company misses earnings expectations by a few pennies, or how and when Brexit may play out. 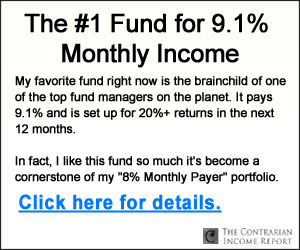 Thanks to his work, you no longer have to settle for low bond yields, or stocks like Bed Bath and Beyond that can lose more in one day than it pays in two years of dividends. Preferred Stocks– Brett lets you know two of the best active managers in this space to invest alongside with. Recession-Proof REITs– discover two REITs that will grow above trend in any interest rate environment.